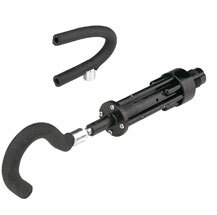 The pneumatic Limb Shaker, or hook shaker, is designed for fruit thinning and nut harvesting. Simply hook a limb and squeeze the trigger. A quick, vibrating motion immediately sends fruit to the ground. 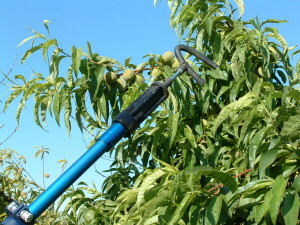 As a nut harvester the tool is exceptional in young trees and small acreage where knocking is commonly applied. Thinning stone fruit has never been quicker or easier.